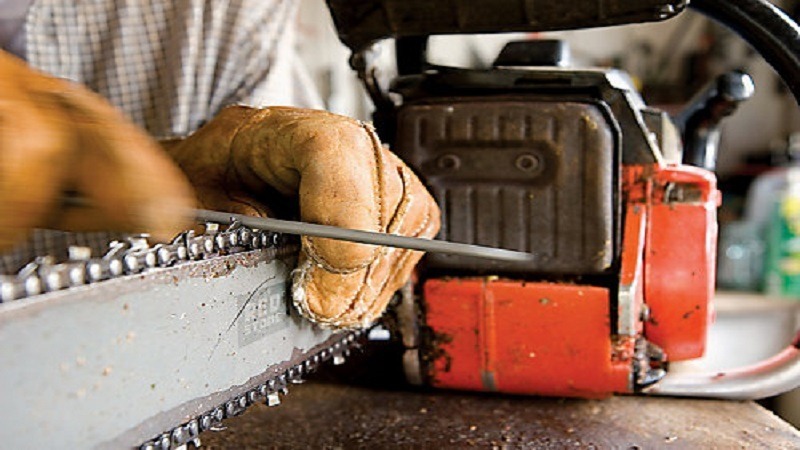 With each use, your chainsaw chain will definitely pick some resin and sap from the wood wherein it is applied. When this is complemented with the gum, chain lubricant, sawdust, and dirt, the end result is completely hardened debris. This definitely compromises the performance of the equipment. It is only fair and logical to get rid of this dirt from time to time. Take some time to learn about how to go about this issue from the discussions below. Turn off the chainsaw. Switch it off from the main switch and then proceed to detach the spark plug wire from the engine. You do not want to make the chainsaw easier to turn on accidentally if you truly care for your safety. Given that most spark plugs are hidden from view, you will have to consult the manufacturer’s manual for appropriate guidance. Next, loosen the adjustment knob on your chainsaw. This to create sufficient slack on the chain which is necessary to let it slip it off its guide bar. After this, remove the chain from the saw. At this stage, prepare a suitable solvent for the job. The household ammonia is by far the best solution for this job. To do so, mix one cup of household ammonia with one gallon of water. Use a plastic bucket to do this mixing. Introduce the chain in this solution. Leave the chain to soak for some time. The exact time should be determined by the amount of dirt that the chain possesses. This initiative is necessary as it loosens the dirt and makes it easier for you to, later on, scrub it off from the chain. Scrub the dirt off the chain carefully and slowly. Use the soft-bristled scrubbing brush to do so. You might have to soak and scrub repeatedly until the result is sparkling clean. Be sure that the chain is grit-free. Place the chain under some running water to rinse thoroughly. As soon as all the detergent and debris are completely washed off, you want to dry the chain with some clean towel. Ensure that the moisture is completely soaked after which you are to place the chain out in the open to be dried by the sun. As soon as the chain is completely dry, oil it before fixing it back onto the chainsaw guide bar. Pour some chain oil over it until it is completely impacted or submerged by it. Leave to settle for around three hours. Dab the chain using some clean paper towels to soak up excess oil drips. It is now ready to reinstall. Needless to say, many cleaning options abound. It is up to you to investigate and find the one that is convenient or relevant to your unique situation. You need not necessarily stick to this plan.